My friend, Maryellen, wearing one of her favorite empire tunic tops in plus size. 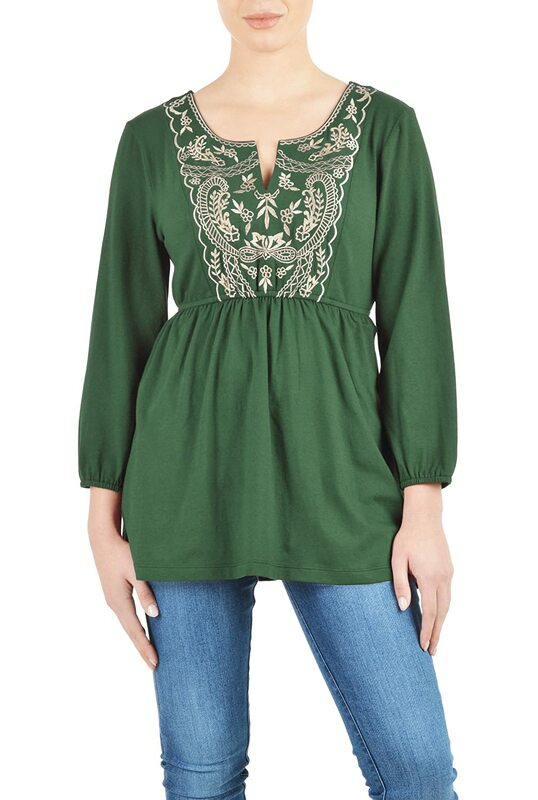 Today I am thinking about pretty empire tunic tops for plus size women. My dear friend, Maryellen, is a plus size woman who is big fan of empire tunic tops. She wears them a lot, and they look great on her! Here is her picture, so you can see. She is even cuter in real life! I love her! Such a sweetheart! I remember watching a television show several years ago about what plus size women should wear to look as attractive as possible. They said that the waistband of your top, or dress, should be at the narrowest portion of your torso. For a lot of us big ladies, that is right under the bustline. For those of us who have lost our waistlines over the years, the area below the bra band has become our new waist! We also like to cover our seats, at least I do! Young gals today may feel comfortable letting their rearview show, as far as I am concerned I would rather keep that covered. I don’t feel like that is my most attractive asset. Know what I mean? So, keeping in mind how slenderizing this style is for many of us, and establishing that we like the longer length, let’s have a look at some of this season’s most stylish empire tunic tops. Plus size women love them! And there are so many great choices! I love this new top from eShakti! It’s a pretty color, bottle green, and the embellishment is exceptionally beautiful. This top is very new, so there aren’t any reviews on Amazon yet; but, I feel comfortable recommending it. I know that eShakti is a reputable company with well-constructed clothing. I almost bought my wedding dress from this company, but ended up going with a Jessica London instead. This top comes in regular and plus sizes. The regular sizes start at 00. The plus sizes start at 16W and go to 36W. You can machine wash the shirt in cold water, and I would hang it to dry. It is made from a cotton/spandex, jersey knit with a light stretch. One great thing about this top is that after you select your size, you will then get to customize your top! You enter your height; then, you can select whether you want short, elbow-length, 3/4-length, or long sleeves. You also choose the length of the top. So, you can get it below hip length, mid-thigh length (my favorite), or mini-length, which is cute with leggings. Another thing I like is that it has little tabs inside to hold your bra straps. This is such a great idea, I don’t know why more clothing manufacturers don’t add this feature. This is a fantastic opportunity to get a very special top that you can customize exactly to your specifications. I just had to tell you about it! Keep in mind that your top is being custom-made for you, so the delivery will take a little bit longer to get to you than your typical Amazon delivery. After all, these aren’t sitting in the Amazon warehouse waiting for your order; your shirt is uniquely made, just the way you want it! Here is another fun empire tunic top in plus size that I love! This one, by CANARI, comes in 15 (yes, fifteen!) different colors, so you can certainly find one that complements your complexion and goes with your wardrobe. As you can see from the picture, this top looks great with jeans. It is made of a rayon/spandex blend, so you could also dress it up a bit. Depending on the setting, it might be suitable for work. It would certainly be pretty for a casual dinner date, or maybe even worn to church! One thing I like about this company is that they use plus-size models. That is one pet peeve I have with so many companies that make clothes for us, they show them on models who are so thin, we can’t tell how the garments will look on us. But, this company has enough respect for us to show us modeling our own clothes! I appreciate that! And, it makes me want to give them my business! The sizes of this top start at 14W and go up to 24W. More Plus Size Empire Tunic Tops! Click here to see more great tunic tops for plus size women!